Once upon a time, there were seven burbling creeks winding their way across the Salt Lake Valley, each one depositing its clear waters into the Jordan River. These seven creeks were named after the seven canyons from which they came—Red Butte, Mill, City, Emigration, Parley’s, Big Cottonwood, Little Cottonwood … and Doc. Sadly, due to growth and urbanization, Salt Lake’s seven creeks have been culverted—tucked away, running unseen and unused in pipes beneath the city. Enter the Prince Charming of our tale, an organization called Seven Canyons Trust. SCT aims to restore and reintegrate Salt Lake’s seven creeks by raising awareness with true love’s magical kiss—er, wait. Actually, it’s a relay race taking place May 14 called Range 2 River Relay … twice as practical and just as fun! The Range 2 River Relay is a bike/boat/run race designed to trace some of our valley’s hydrology and spark conversation about the buried potential of our culverted creeks. 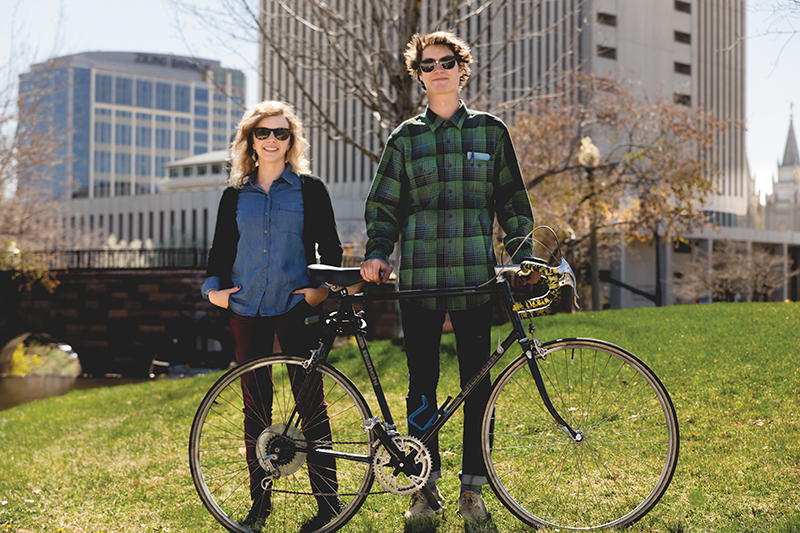 The cyclists will follow City Creek from its healthy source in the foothills and down along its culverted section under North Temple to the Utah State Fairpark, where the creek empties into the Jordan River. The canoes will set off from there, down the Jordan River, and the runners will race back along the Jordan River Parkway. The race will end at the Get Into the River at Night festival in the fairpark. “What I’m hoping,” says Brian Tonetti, co-director and founder of the Seven Canyons Trust, “is that the race immerses into this festival and people stay around, get food and wine, et cetera.” There will also be a free concert that evening, featuring Holy Water Buffalo. The event aims to be a casual, family-friendly race. Each leg is less than four miles. “I don’t want it to be some spandex-type of event, you know?” says Tonetti. Entry costs $15 per team of three, and you can sign up now at SCT’s website, sevencanyonstrust.org. Tonetti hopes to provide canoes for racers, and his organization has secured a sponsorship from SLC’s nonprofit bike share program, GREENbike. “We’re providing 15 GREENbikes for participants,” says Will Becker, GREENbike’s Director of Planning and Operations. Becker commends SCT for its dedication to “rehabilitating the amazing water resources in our communities that we all benefit from and that are often taken for granted or go unnoticed.” The two nonprofits have a basic goal in common: “We’re both working to make a positive impact on our natural surroundings and [to] enhance the quality of life for people in our city,” says Becker. For SCT, one positive impact comes from a process called daylighting. Daylighting means bringing our city’s seven creeks back to the surface and integrating them into the urban environment in a variety of beneficial ways. Salt Lake is already home to one major daylighting project, City Creek Park. After the floods of ’83, “there was a movement,” says Tonetti, “to diminish these stormwater conveyance choke points and to mitigate flooding through [daylighting].” And it worked. Daylighting our creeks has a host of positive environmental benefits as well. Natural, porous creek beds actually purify and filter water. “Whereas in a culverted system, the pollutants in the water are closed in a pipe, so they’re not infiltrating into the ground. You send them directly into downstream communities by the Jordan—so it becomes an environmental-justice issue as well. These West Side communities who are lower income are forced to deal with all these pollutants and degraded water quality from the East Side communities,” says Tonetti. There are over 21 miles of buried creek below our feet—this happily-ever-after is a lofty goal indeed. But thanks to Seven Canyons Trust and the first annual Range 2 River Relay, one day, our valley might regain its title as the fairest one of all.